A Review of FAC 2016: Culture Cannot Wait! The FAC 2016 participants and teachers in front of the Smithsonian Castle during the Opening Ceremony, June 2, 2016. Members of this research network study the causes of targeted cultural heritage destruction, but one of the questions that often arises from this difficult discussion concerns the aftermath: Is it possible to protect cultural heritage in the event of a disaster? If yes, then when is the appropriate time to intervene, and who can contribute? Seeking answers to these types of questions is the premise of ICCROM’s international training called First Aid to Cultural Heritage in Times of Crisis (FAC). This course has been part of ICCROM’s Disaster Risk Management program for over a decade, but the recent iterations of this training are due to a partnership with the Smithsonian, along with the Prince Claus Fund, and the Netherlands National Commission for UNESCO (who hosted a FAC course last year in Amsterdam). 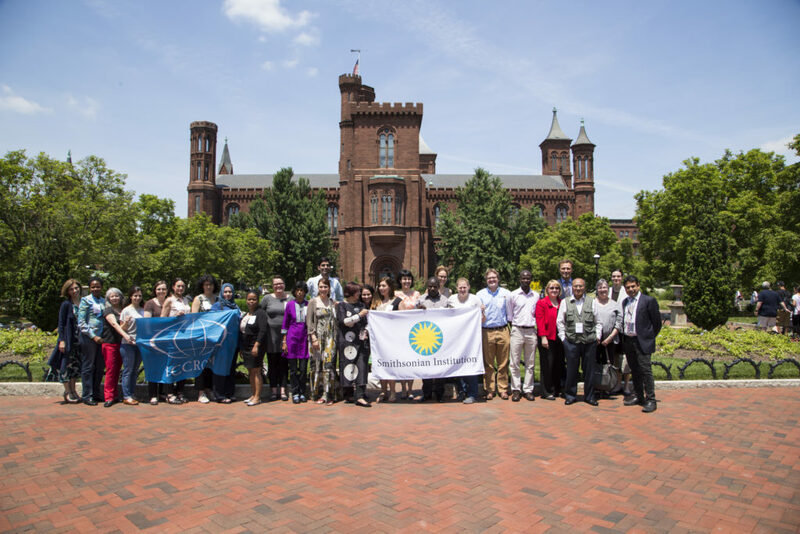 The most recent hosting of FAC took place at the Smithsonian Institution in Washington D.C., from June 2-29, 2016. The core objective of FAC is to expand the capacity for disaster response among cultural heritage professionals, yet becoming one of these “cultural first-aiders” does not mean simply improving one’s practical skills in object salvage and handling. The course’s philosophy drives at the principle that being a cultural first-aider requires a humanitarian mind-set of cultural respect and impartiality. Outlined in an extensive infographic that breaks down the process of a disaster response, FAC advocates that cultural first-aiders must make sure their actions align by these humanitarian principles of neutrality and sensitivity. 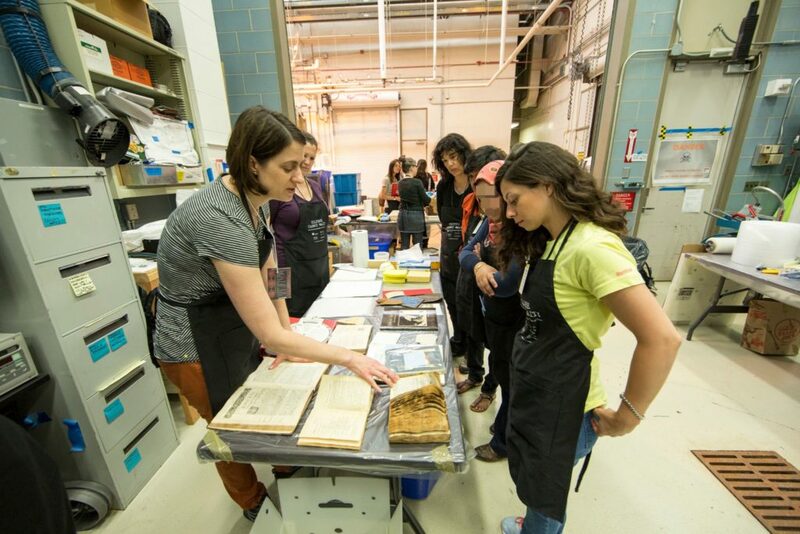 Conservators from all over the Smithsonian shared information on how to handle damaged objects and taught steps to take with each type to prevent further damage. FAC 2016’s program echoed previous courses in its intensity and ambition: rather than having a training that focused only on architectural stabilization, or documentation practices, or even on more subjective skills, such as leadership and team-building, the 4-week course combined them all. Substantial coursework, coupled with a “camp-like” atmosphere, as the majority of the participants shared rooms in a local apartment complex, demanded participants’ attention, dedication, and stamina. Out of the 20+ days of teaching, 7 were devoted to complex practical exercises. Throughout each of these, the 21 participants were expected to work in small teams, manage their own time, oversee their own stock of supplies, and interact with role players that either aided or potentially interfered with their work, again emphasizing that responding to crises concerning heritage requires patience and resourcefulness. 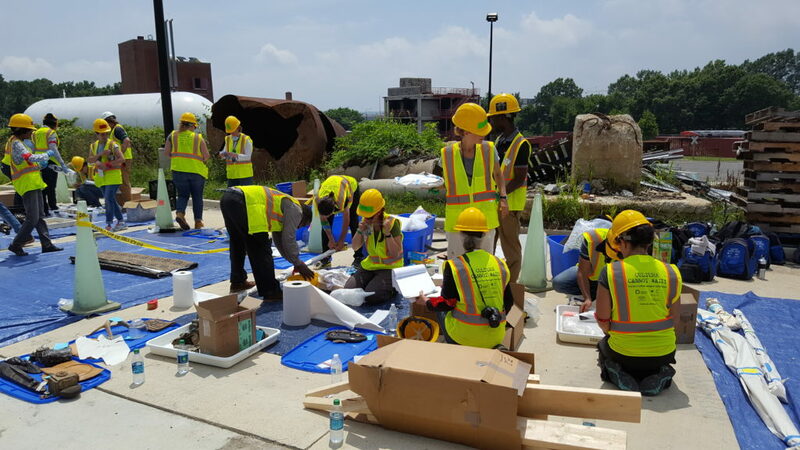 FAC 2016 instructors continually demonstrated to participants that in situations like Haiti, or even locally contained disasters such as the Georgetown Public Library fire, there is no fool-proof “manual” for cultural heritage professionals to follow when it comes to a disaster. 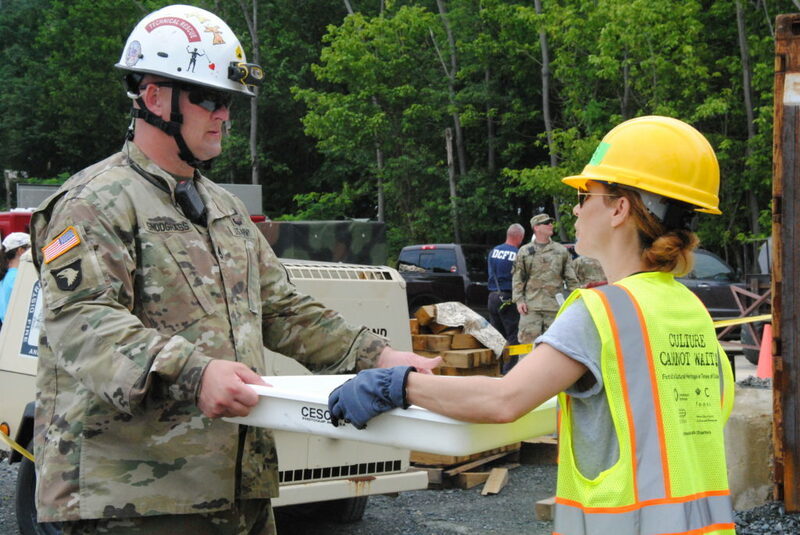 Participants must be proactive in their respective regions and build interdisciplinary relationships within their own emergency response systems before a disaster strikes, and then utilize those relationships during the crisis. In order to aid participants’ work in creating these networks and strengthening capacity, the Prince Claus Cultural Emergency Response Programme (CER) plans to award seed money to FAC participants who submit continued “first-aid” proposals once they return home. During the final exercise of FAC 2016, participants had to work with members of the military while conducting their response mission. As El Hassan Bin Talal said in his concise article lamenting the destruction of Palmyra’s Baal Shamin Temple and Temple of Bel in September of last year, “our shared heritage” allows for an “evaluation of one’s own society in relation to others.” As FAC 2016 welcomed 21 participants from 17 different countries, this proposition became palpable in the numerous evaluations of each participant’s work in their professional organizations. Regardless of the different issues and diverse viewpoints amongst the group, they were still shared, debated, and discussed in an open and positive manner, united around the belief that saving heritage was absolutely integral to a community’s recovery from a disaster. Participants setting up and managing their object recovery area during the final exercise. I highly appreciate this piece. I now have a deeper understanding of FAC. Capacity building is of great essence for those involved in any kind of activity. I believe the participants of this program are well equipped for rescue missions. I appreciate that the element of humanitarian was inculcated during the training. Well done.